The USS COLLETT (DD-730) was a Bath built Sumner class destroyer commissioned 16 May 1944. COLLETT saw substantial action in the Pacific through the end of the war earning six Battle Stars. 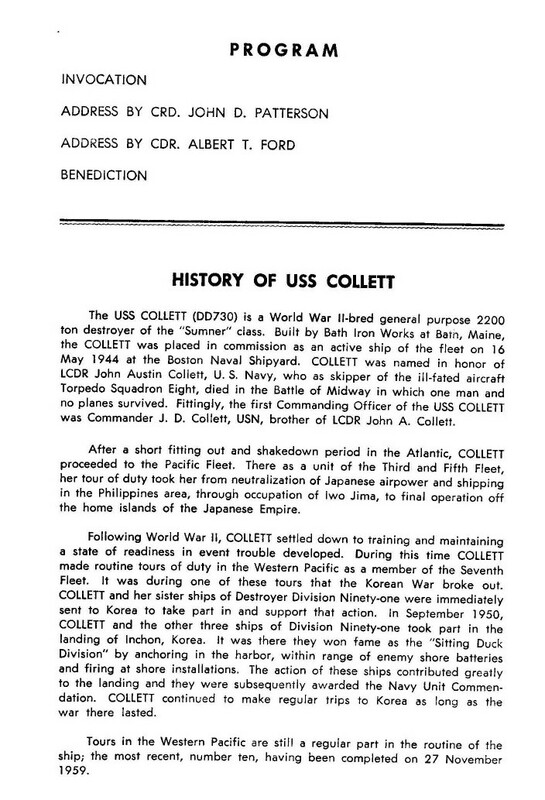 During Korea, COLLETT was one of the first destroyers into the conflict and was part of the “Sitting Duck Squadron” during the invasion at Inchon. COLLETT served three tours during the Korean action earning a Navy Unit Commendation and six battle stars. I reported aboard COLLETT in the summer of 1959 during a Westpac tour as a newly minted Ensign. The proud ship had been used hard since being commissioned on 16 May 1944 and was tired and in need of a lot of TLC. 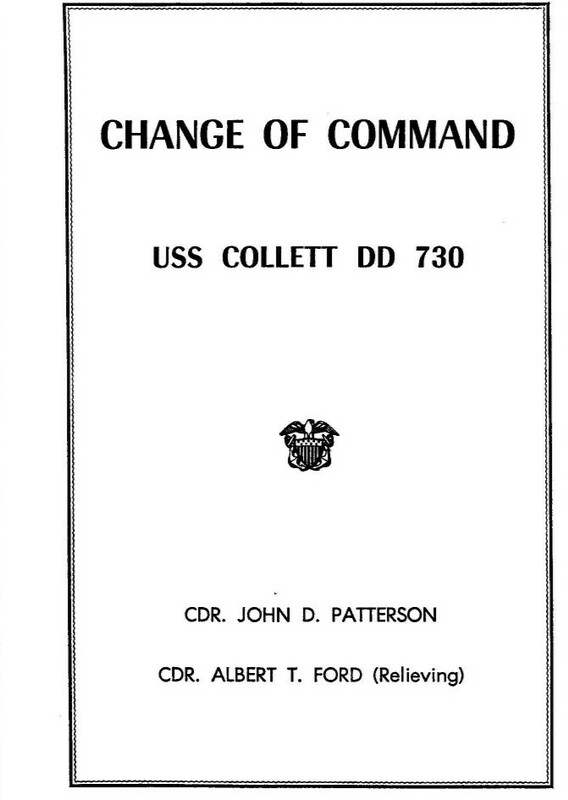 COLLETT was chosen as the second ship on the West Coast to go through the FRAM II modernization program. The overhaul was started after the first of the year, 1960. A substantial part of the crew was transferred off with the remainder staying aboard for the modernization. 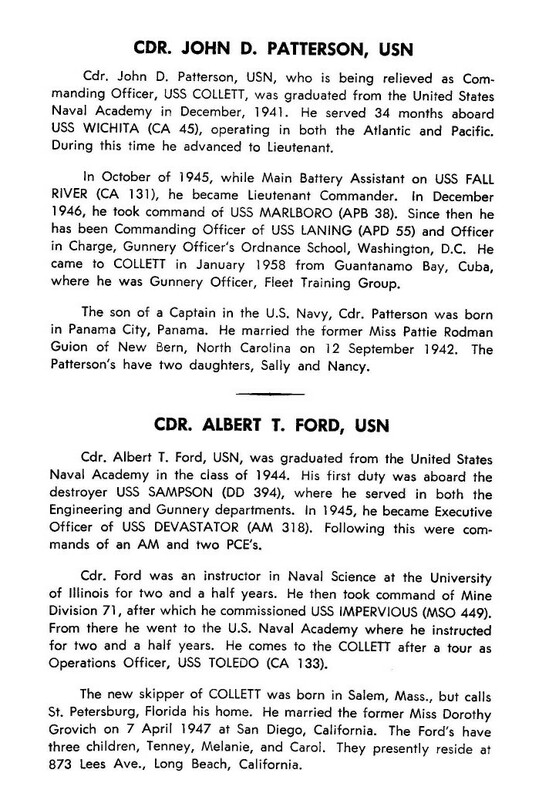 A new commanding officer, CDR A.T. Ford, reported aboard. The changes to the ship during FRAM were substantial. The old 40mm secondary battery, 21 inch torpedo tubes and depth charges were all removed. The deckhouse aft of the bridge disappeared down to the main deck and was replaced with a new aluminum deckhouse with taller stacks and a flight deck and hangar for the anticipated DASH program. One of the big changes to the ship was the replacement of virtually all of the electronic gear with new, modern equipment. Toward the end of the modernization program, we started to receive new crew members to bring the ship up to complement. At this time, I was the Communications Officer. On 19 July 1960, while still attached to the shipyard, COLLETT made preparations to go to sea for sea trials. The crew was mostly green and many had never been to sea as a team. Much of the equipment was new and unfamiliar. Many shipyard workers were aboard. The plan of the day was to leave Long Beach and steam down toward Seal Beach where the ship was to do one 360 degree turn for antenna calibration. We were then to steam out to sea for a full power run to test the overhauled engineering plant. I was the Sea Detail CIC officer. The fog was thick and visibility was poor. After clearing the breakwater, the Sea Detail was secured and the underway watch was set. I was relieved and left CIC to go about my business as Communications Officer. As the ship built up steam for the full power run, one radar contact was being plotted in CIC. As that contact passed CPA [closest point of approach], we were off Seal Beach and the planned 360 degree turn was started. The fog was still very thick. I was called down to check something out in a space on the main deck forward on the starboard side. While in that space I heard a loud grinding noise and was knocked over. When I picked myself up and went forward on the main deck, I was shocked to see the damage. There was no other ship in sight but it was obvious what had happened. I was called to the bridge to make sure the proper messages were sent out. What had happened was that at about the 270 degree point in our 360 degree turn we had hit our contact which, when the fog lifted, we determined to be the USS AMMEN (DD-527). When we hit her, our bow penetrated the AMMEN’s after fireroom tearing off COLLETT’s peak tank and leaving it embedded in the AMMEN. COLLETT’s bow was split in two back to the anchor windlass by AMMEN’s main deck. The lower half of the bow was crumpled to starboard. The top of the bow was then almost torn off along with most of AMMEN’s after deckhouse. At this time, our starboard (not port) anchor was torn off and left in the remains of the AMMEN’s deckhouse. Our upper bow piece was still attached by about three feet of metal and turned around facing aft. One COLLETT sailor was in that piece of the bow but was somehow uninjured. Another COLLETT sailor who was in the bos’n’s locker somehow was left hanging out over the remains of the bow with his right leg trapped under the anchor windlass. That was all that kept him from falling overboard. Somehow, his only injury was a badly broken leg. He was COLLETT’s only injured crew member. Later, as the fog finally lifted, a Marine Corps helicopter arrived with two doctors to treat the injured. Because we had a flight deck, the helicopter hovered over it to drop the doctors off but the flight deck was not large enough for the aircraft to actually land. I went out of Radio Central to the deck between the stacks to watch when the helicopter rotor blades struck a stanchion on top of the hangar. As the rotors disintegrated with pieces flying in every direction, the helicopter crashed on our flight deck. Somehow, there was no fire and no injuries. I could hardly believe what I had just seen. We managed to make it back to port under our own steam, going backwards to avoid stressing the bulkheads that were exposed to the sea. The press was all over the disaster. I want to stress that I have nothing but respect for CDR Ford and his demeanor throughout all that followed. He stood up for his crew and personally accepted full responsibility for the accident. The COLLETT was inspected and it was determined that the damage could be repaired and because of the extensive FRAM renovation, she should not be scrapped. The USS SEAMAN (DD-791) was a destroyer that was not completed at the end of WWII and was chosen to be the donor to replace the shattered bow. The ship was towed down to Long Beach from Seattle where she had rested since the shipyard workers put down their tools when the war ended. The two ships were put into drydock together and the damage was cut off of the COLLETT. Then the bow was cut off the SEAMAN and lined up with the front of the COLLETT. The repair was one continuous weld all the way around the ship. The rest of the SEAMAN was then scrapped. The next important thing that happened was that CDR Robert B. Kitt and LCDR. 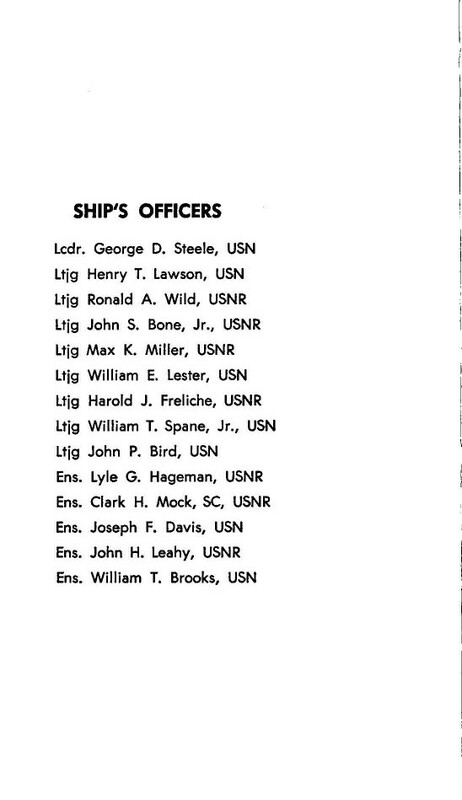 John G. Palmer reported aboard as the new CO and XO. They found a crew that needed to be worked into a team. These two officers were the best thing that could have happened to this ship at a really bad time. COLLETT went on to serve with pride and excellence into the Vietnam conflict where she saw more action. She was finally decommissioned in December 1970. The ship saw more action as the ARA PIEDRA BUENA (D-29) of the Argentine Navy during the Falklands War. During that conflict, when the cruiser ARA GENERAL BELGRANO was sunk by the British submarine HMS CONQUEROR on 2 May 1982, the PIEDRA BUENA was responsible for rescuing some 400 sailors from the cruiser. In 1984, the ship was decommissioned once more and in November 1988 was sunk as a target during a gunnery exercise. What a sad end to a proud ship. The events of 19 July 1960 are something I will never forget. The important thing is that the memory of this ship that served so well be not be only that of one really bad day. At the same time, we need to remember the crewmembers of the AMMEN who were lost or injured on that day.